Updated Contact - Triggers when a contact is updated. Contact Subscribed - Triggers when a contact subscribes. New Contact - Triggers when a contact is created. New List - Triggers when a new list is created. New Sender Property - Triggers when a new sender property is created. Contact Unsubscribed - Triggers when a contact unsubscribes. New Message - Triggers on a new message. New Contact in List - Triggers when a contact is created in the given list. Find Contact - Finds contact by search field. Find Sender Property - Finds Sender Property by search field. Subscribe Contact to List - Subscribes a contact to a given list. Unsubscribe Contact - Unsubscribes a contact from a given list. 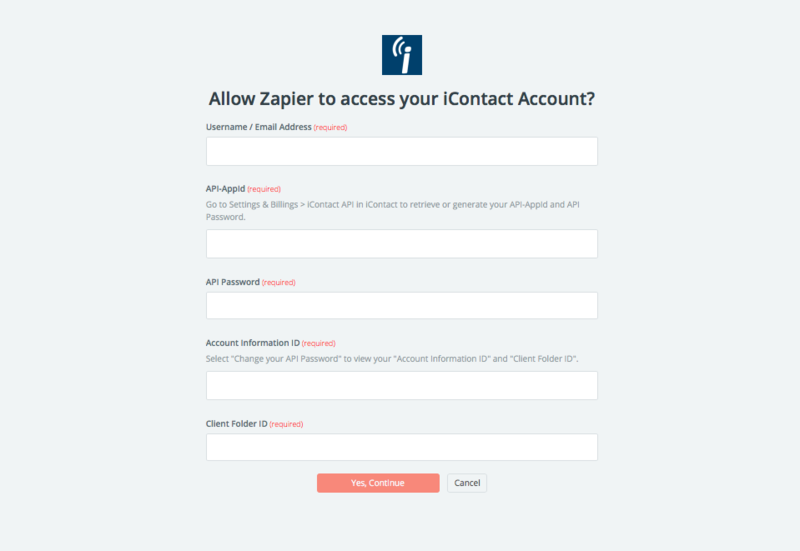 Create Contact - Creates a new contact in your account. Send HTML Message - Creates and sends a new message from custom HTML. Create Sender Property - Creates a new sender property. Update Contact - Updates a contact. 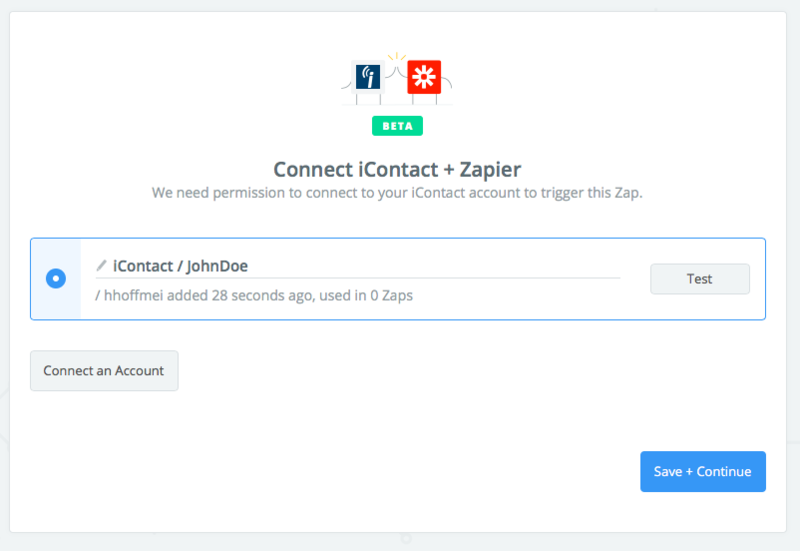 When you start creating a iContact Zap, you will be asked to connect your iContact account. Next, you'll be asked to enter your iContact API key. 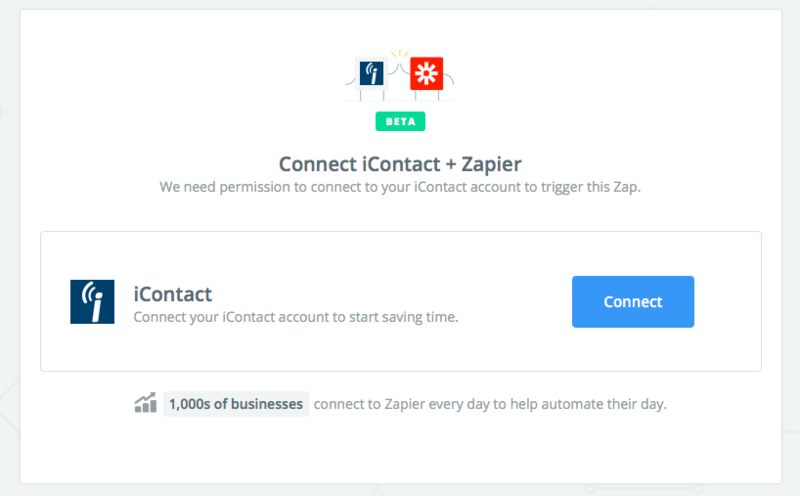 Click on "Settings and Billing"
Paste your key back into your Zapier account and then “Continue”. If all steps were successful your iContact account will now be successfully connected.